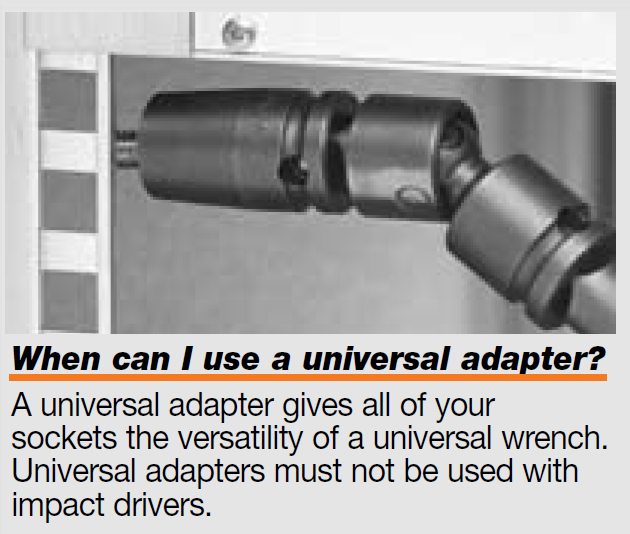 When can I use a universal adapter? 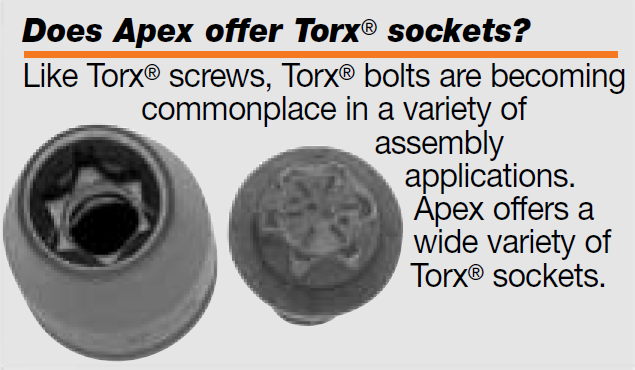 Does Apex offer Torx® sockets? 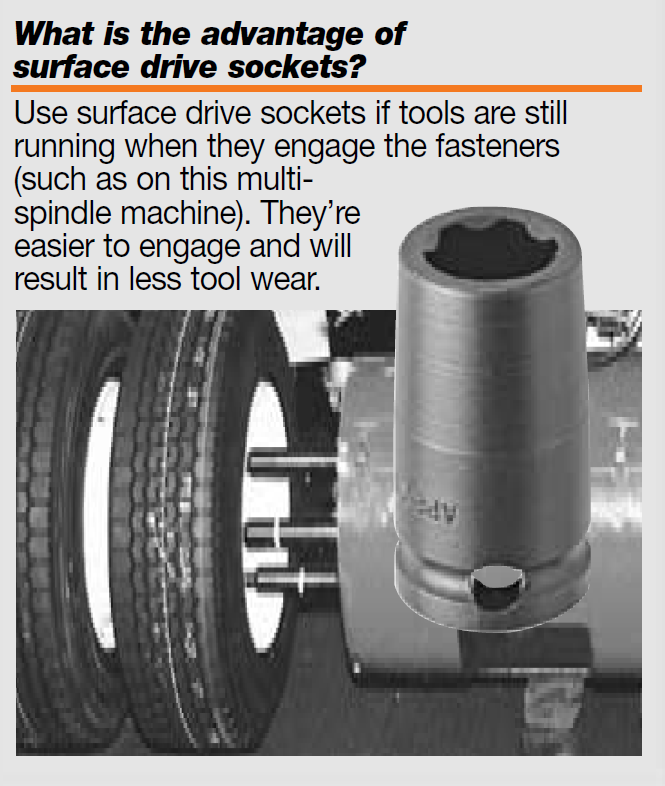 What is the advantage of surface drive sockets? 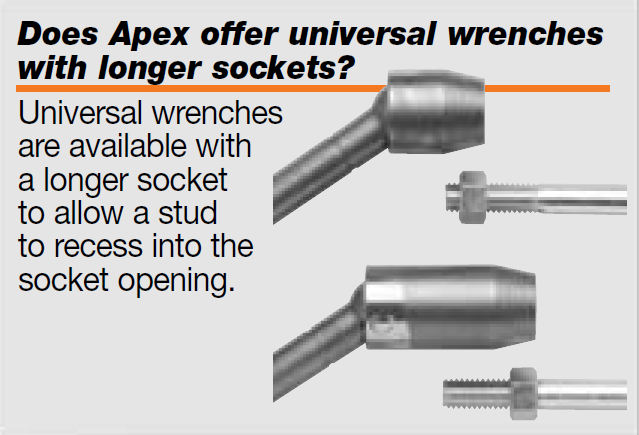 Does Apex offer universal wrenches with longer sockets? What is the benefit of a tension sleeve? 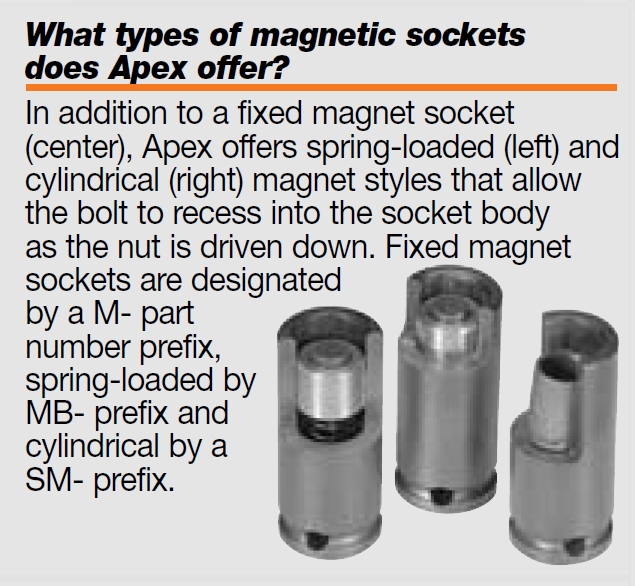 What types of magnetic sockets does Apex offer? 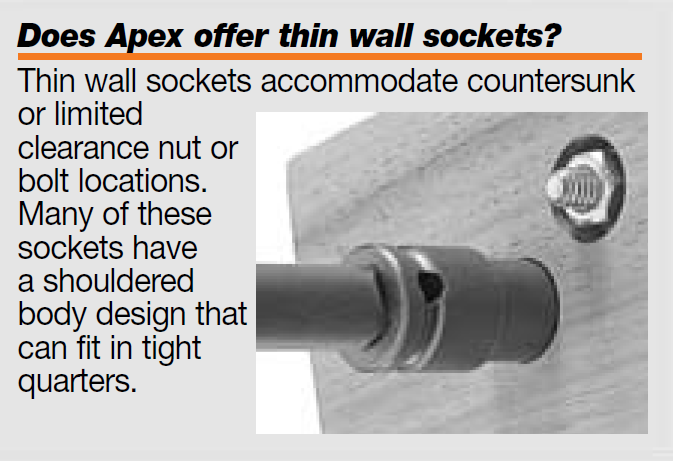 Does Apex offer thin wall sockets? 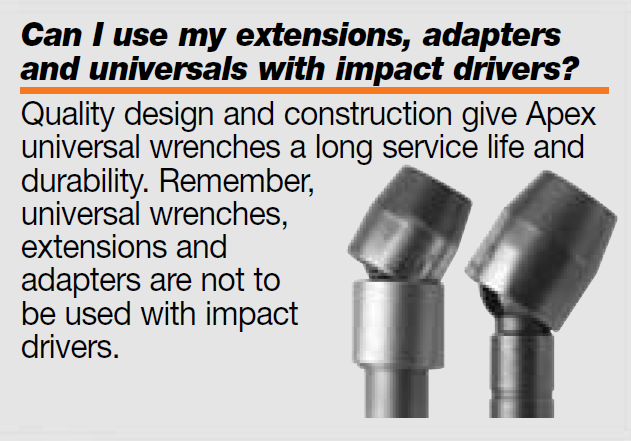 Can I use my extensions, adapters and universals with impact drivers? Does Apex offer a complete line of extensions? 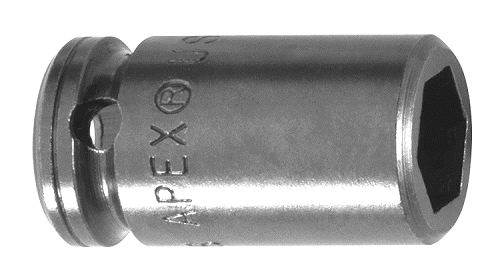 For more than half a century Apex Tool Group has maintained a position of leadership in industrial fastening tools. 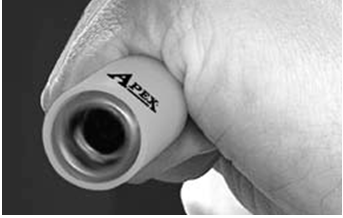 Today, Apex Tool Group stands ready to improve the productivity of assembly operations around the world with unsurpassed tool performance and customer service. 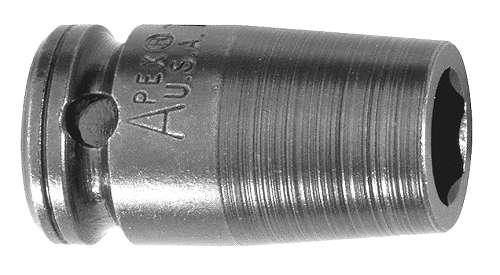 Apex Tool Group manufactures every tool to the tightest tolerances in the industry to insure a precision fit. 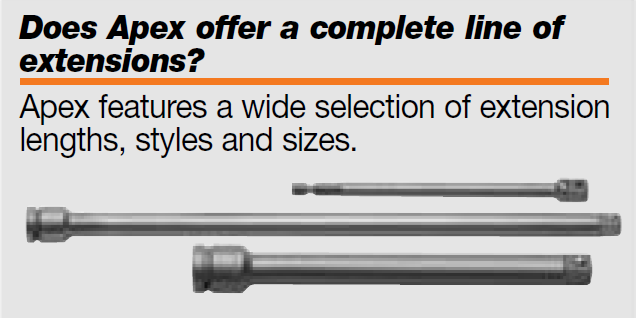 Each Apex tool is tempered with a proprietary heat treating process that can produce tools with wear resistance ten times that of competitors' tools. 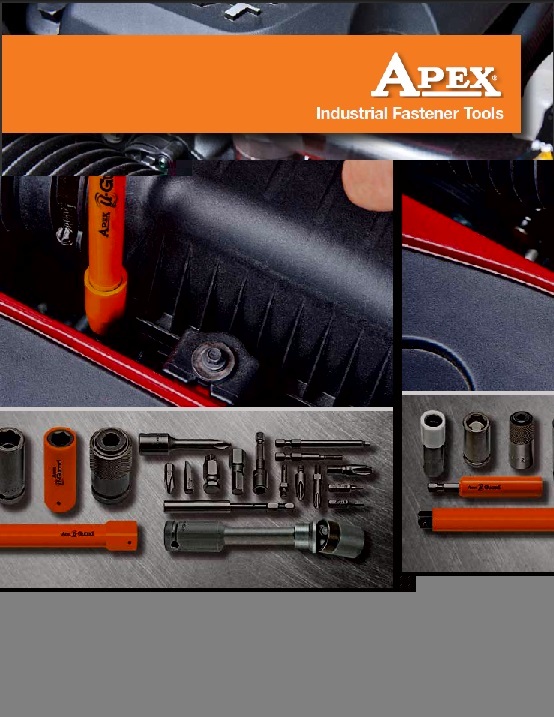 Apex Tool Group offers over 3,000 products so it is likely that you will be able to find a solution for your fastening needs right off the shelf. 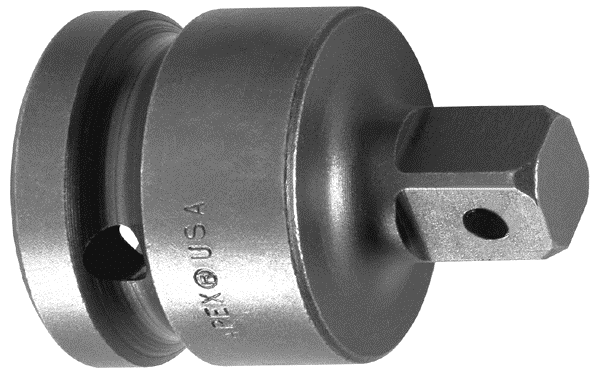 Insert and power drive bits are available to meet a huge variety of fastener styles including Phillips, Slotted, Torx, Torx Plus, Torx Tamper Resistant, Torx Plus Tamper Resistant, Pozidriv, Sel-o-fit, Quadrex, Frearson, B.N.A.E., Socket Head, Square Recess, Torq-Set, MorTorq, Tri-Wing, Hi-Torque and Triple Square. 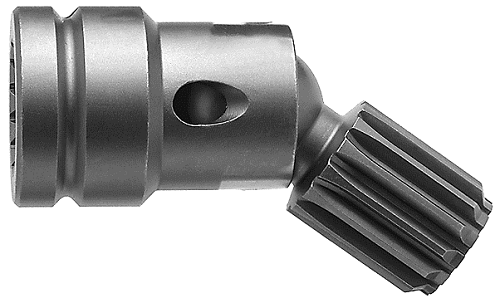 Bit holders enable the flexible use of insert bits with a variety of tools. Magnetic bit holders are available as well as quick release bit holders. IN addition, Apex offers a complete line of quick release chucks for fast and easy power bit changes. Hand drivers are available for interchangeable insert bits. Magnetized drivers are available as well. 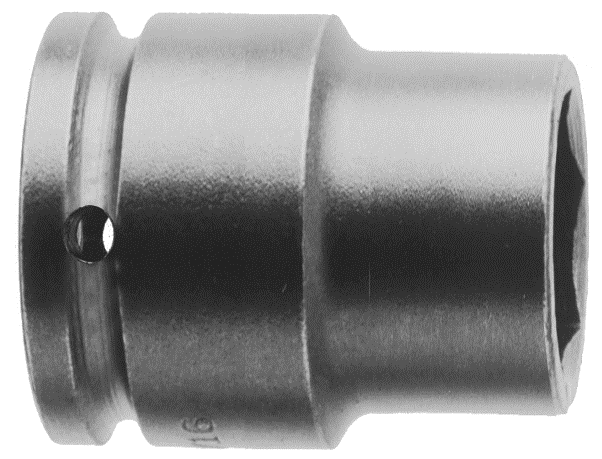 Hex drive nutsetters, extensions and universal wrenches allow nutrunning in all types of applications. 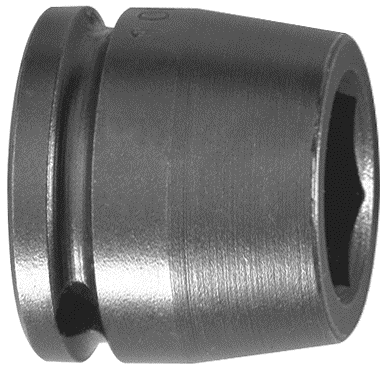 Hex drive sockets, extensions, adapters and universal wrenches allow nutrunning in all types of applications. 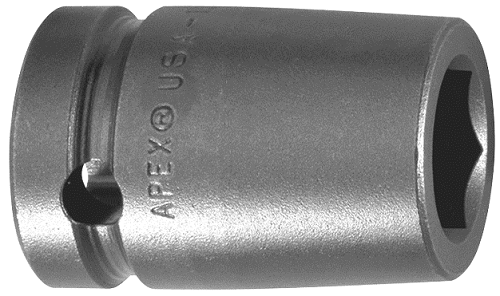 Apex μ-Guard provides a protective barrier between genuine Apex fastener tools and your finely finished workpiece. The free-spinning design provides maximum protection for polished and highly sensitive surfaces. μ-Guard is made of a thermo plastic urethane which cushions against costly incidental side impacts. It is non-removable for tamper resistance. 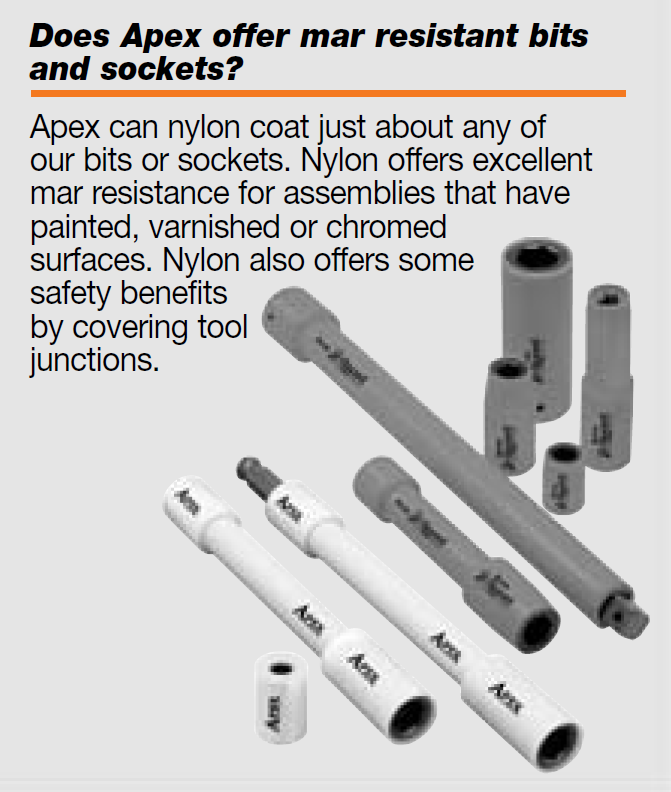 Does Apex offer mar resistant bits and sockets? 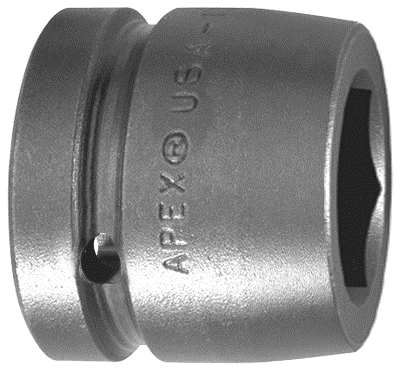 Apex offers a variety of specialized products from Tap Holding Sockets to Grease Fitting Sockets to meet your fastening needs.